"Agesilaus" redirects here. For Xenophon's work, see Agesilaus (Xenophon). For the semi-legendary earlier king, see Agesilaus I.
Agesilaus II (/əˌdʒɛsəˈleɪəs/; Greek: Ἀγησίλαος Agesilaos; c. 444/443 – c. 360 BC), was a king (basileus) of the ancient Greek city-state of Sparta[a] and a member of the Eurypontid dynasty ruling from 398 to about 360 BC, during most of which time he was, in Plutarch's words, "as good as though commander and king of all Greece," and was for the whole of it greatly identified with his country's deeds and fortunes. Small in stature and lame from birth, Agesilaus became ruler somewhat unexpectedly in his mid-forties. His reign saw successful military incursions into various states in Asia Minor, as well as successes in the Corinthian War; however, several diplomatic decisions resulted in Sparta becoming increasingly isolated prior to his death at the age of 84 in Cyrenaica. Agesilaus was the son of Archidamus II and his second wife, Eupoleia, brother to Cynisca (the first woman in ancient history to achieve an Olympic victory), and younger half-brother of Agis II. There is little surviving detail on the youth of Agesilaus. Born with one leg shorter, he was not expected to succeed to the throne after his brother king Agis II, especially because the latter had a son (Leotychidas). Therefore, Agesilaus was trained in the traditional curriculum of Sparta, the agoge. However, Leotychidas was ultimately set aside as illegitimate (contemporary rumors representing him as the son of Alcibiades) and Agesilaus became king in 398, at the age of about forty. In addition to questions of his nephew's paternity, Agesilaus' succession was largely due to the intervention of the Spartan general, Lysander, who hoped to find in him a willing tool for the furtherance of his political designs. Lysander and the young Agesilaus came to maintain an intimate relation (see Pederasty in Ancient Greece), as was common of the period. Their unique relationship would serve an important role during Agesilaus' later campaigns in Asia Minor. Agesilaus is first recorded as king during the suppression of the conspiracy of Cinadon, shortly after 398 BC. Then, in 396, Agesilaus crossed into Asia with a force of 2,000 neodamodes (freed helots) and 6,000 allies (including 30 Spartiates) to liberate Greek cities from Persian dominion. On the eve of sailing from Aulis he attempted to offer a sacrifice, as Agamemnon had done before the Trojan expedition, but the Thebans intervened to prevent it, an insult for which he never forgave them. Armoured cavalry of Achaemenid Hellespontine Phrygia attacking a Greek psiloi at the time of the invasion of Agesilaus, Altıkulaç Sarcophagus, early 4th century BCE. On his arrival at Ephesus in 396 BC, a three months' truce was concluded with Tissaphernes, the satrap of Lydia and Caria, but negotiations conducted during that time proved fruitless, and on its termination Agesilaus raided Hellespontine Phrygia, where he easily won immense booty from the satrap Pharnabazus; Tissaphernes could offer no assistance, as he had concentrated his troops in Caria. In these campaigns Agesilaus also benefited from the aid of some of the Ten Thousand (a Greek mercenary army), who had marched through miles of Persian territory to reach the Black Sea a few years earlier (401-399 BC). After spending the winter organizing a cavalry force (hippeis), he made a successful incursion into Lydia in the spring of 395. Tithraustes was sent to replace Tissaphernes, who paid with his life for his continued failure. Meeting between Spartan king Agesilaus (left) and Pharnabazus II (right) in 395 BC, when Agesilaus agreed to remove himself from Hellespontine Phrygia. An armistice was concluded between Tithraustes and Agesilaus, who left the southern satrapy and again invaded Hellespontine Phrygia, which he ravaged until the following spring. He then came to an agreement with Pharnabazus whom he met personally, and once more turned southward. During these campaigns, Lysander attempted to manipulate Agesilaus into ceding his authority. Agesilaus would have nothing of this, and reminded Lysander (who was only a Spartan general) who was king. He had Lysander sent away to assist the naval campaigns in the Aegean. This dominating move by Agesilaus earned the respect of his men-at-arms and of Lysander himself, who remained emotionally close with Agesilaus. In 394, while encamped on the plain of Thebe, Agesilaus was planning a campaign in the interior of Asia Minor, or even an attack on Artaxerxes II himself, when he was recalled to Greece to fight in the Corinthian War between Sparta and the combined forces of Athens, Thebes, Corinth, Argos and several minor states. The outbreak of the conflict had been encouraged by Persian payments to Sparta's Greek rivals. Tens of thousands of Darics, the main currency in Achaemenid coinage, were used to bribe the Greek states to start a war against Sparta. According to Plutarch, Agesilaus said upon leaving Asia Minor "I have been driven out by 10,000 Persian archers", a reference to "Archers" (Toxotai) the Greek nickname for the Darics from their obverse design, because that much money had been paid to politicians in Athens and Thebes in order to start a war against Sparta. A rapid march through Thrace and Macedonia brought him to Thessaly, where he repulsed the Thessalian cavalry who tried to impede him. Reinforced by Phocian and Orchomenian troops and a Spartan army, he met the confederate forces at Coronea in Boeotia and in a hotly contested battle was technically victorious. However, the Spartan baggage train was ransacked and Agesilaus himself was injured during the fighting, resulting in a subsequent retreat by way of Delphi to the Peloponnese. Shortly before this battle the Spartan navy, of which he had received the supreme command, was totally defeated off Cnidus by a powerful Persian fleet under Conon and Pharnabazus. During these conflicts in mainland Greece, Lysander perished while attacking the walls of Haliartus. Pausanias, the second king of Sparta (see Spartan Constitution for more information on Sparta's dual monarchy), was supposed to provide Lysander with reinforcements as they marched into Boeotia, yet failed to arrive in time to assist Lysander, likely because Pausanias disliked him for his brash and arrogant attitude towards the Spartan royalty and government. Pausanias failed to fight for the bodies of the dead, and because he retrieved the bodies under truce (a sign of defeat), he was disgraced and banished from Sparta. In 393, Agesilaus engaged in a ravaging invasion of Argolis. In 392 BC he made several successful expeditions into Corinthian territory, capturing Lechaeum and Piraeus. The loss, however, of a battalion (mora), destroyed by Iphicrates, neutralized these successes, and Agesilaus returned to Sparta. In 389 BC he conducted a campaign in Acarnania, but two years later the Peace of Antalcidas, warmly supported by Agesilaus, put an end to the war, maintaining Spartan hegemony over Greece and returning the Greek cities of Asia Minor to the Achaemenid Empire. In this interval, Agesilaus declined command over Sparta's aggression on Mantineia, and justified Phoebidas' seizure of the Theban Cadmea so long as the outcome provided glory to Sparta. When war broke out afresh with Thebes, Agesilaus twice invaded Boeotia (in 378 and 377 BC), although he spent the next five years largely out of action due to an unspecified but apparently grave illness. In the congress of 371 an altercation is recorded between him and the Theban general Epaminondas, and due to his influence, Thebes was peremptorily excluded from the peace, and orders given for Agesilaus's royal colleague Cleombrotus to march against Thebes in 371. Cleombrotus was defeated and killed at the Battle of Leuctra and the Spartan supremacy overthrown. In 370 Agesilaus was engaged in an embassy to Mantineia, and reassured the Spartans with an invasion of Arcadia. He preserved an un-walled Sparta against the revolts and conspiracies of helots, perioeci and even other Spartans; and against external enemies, with four different armies led by Epaminondas penetrating Laconia that same year. In 366 BC, Sparta and Athens, dissatisfied with the Persian king's support of Thebes following the embassy of Philiscus of Abydos, decided to provide careful military support to the opponents of the Achaemenid king. Athens and Sparta provided support for the revolted satraps in the Revolt of the Satraps, in particular Ariobarzanes: Sparta sent a force to Ariobarzanes under an aging Agesilaus, while Athens sent a force under Timotheus, which was however diverted when it became obvious that Ariobarzanes had entered frontal conflict with the Achaemenid king. An Athenian mercenary force under Chabrias was also sent to the Egyptian Pharao Tachos, who was also fighting against the Achaemenid king. According to Xenophon, Agesilaus, in order to gain money for prosecuting the war, supported the satrap Ariobarzanes of Phrygia in his revolt against Artaxerxes II in 364 (Revolt of the Satraps). Again, in 362, Epaminondas almost succeeded in seizing the city of Sparta with a rapid and unexpected march. The Battle of Mantinea, in which Agesilaus took no part, was followed by a general peace: Sparta, however, stood aloof, hoping even yet to recover her supremacy. In 361, Agesilaus went to Egypt at the head of a mercenary force to aid the king Nectanebo I and his regent Teos against Persia. He soon transferred his services to Teos's cousin and rival Nectanebo II, who, in return for his help, gave him a sum of over 200 talents. On his way home Agesilaus died in Cyrenaica, around the age of 84, after a reign of some 41 years. His body was embalmed in wax, and buried at Sparta. He was succeeded by his son Archidamus III. Agesilaus was of small stature and unimpressive appearance, and was lame from birth. These facts were used as an argument against his succession, an oracle having warned Sparta against a "lame reign." Most ancient writers considered him a highly successful leader in guerrilla warfare, alert and quick, yet cautious—a man, moreover, whose personal bravery was rarely questioned in his own time. Of his courage, temperance, and hardiness, many instances are cited, and to these were added the less Spartan qualities of kindliness and tenderness as a father and a friend. As examples, there is the story of his riding a stick-horse with his children and upon being discovered by a friend desiring that he not mention till he himself were the father of children; and because of the affection of his son Archidamus' for Cleonymus, he saved Sphodrias, Cleonymus' father, from execution for his incursion into the Piraeus, and dishonorable retreat, in 378. Modern writers tend to be slightly more critical of Agesilaus' reputation and achievements, reckoning him an excellent soldier, but one who had a poor understanding of sea power and siegecraft. As a statesman he won himself both enthusiastic adherents and bitter enemies. Agesilaus was most successful in the opening and closing periods of his reign: commencing but then surrendering a glorious career in Asia; and in extreme age, maintaining his prostrate country. Other writers acknowledge his extremely high popularity at home, but suggest his occasionally rigid and arguably irrational political loyalties and convictions contributed greatly to Spartan decline, notably his unremitting hatred of Thebes, which led to Sparta's humiliation at the Battle of Leuctra and thus the end of Spartan hegemony. Historian J. B. Bury remarks that "there is something melancholy about his career:" born into a Sparta that was the unquestioned continental power of Hellas, the Sparta which mourned him eighty four years later had suffered a series of military defeats which would have been unthinkable to his forbears, had seen its population severely decline, and had run so short of money that its soldiers were increasingly sent on campaigns fought more for money than for defense or glory. Other historical accounts paint Agesilaus as a prototype for the ideal leader. His awareness, thoughtfulness, and wisdom were all traits to be emulated diplomatically, while his bravery and shrewdness in battle epitomized the heroic Greek commander. These historians point towards the unstable oligarchies established by Lysander in the former Athenian Empire and the failures of Spartan leaders (such as Pausanias and Kleombrotos) for the eventual suppression of Spartan power. The ancient historian Xenophon was a huge admirer and served under Agesilaus during the campaigns into Asia Minor. We have reduced most of Asia, driven back the barbarians, made arms abundant in Ionia. But since you bid me, according to the decree, come home, I shall follow my letter, may perhaps be even before it. For my command is not mine, but my country's and her allies'. And a commander then commands truly according to right when he sees his own commander in the laws and ephors, or others holding office in the state. If I have done any noble action, that is a sufficient memorial; if I have done nothing noble, all the statues in the world will not preserve my memory. Agesilaus lived in the most frugal style alike at home and in the field, and though his campaigns were undertaken largely to secure booty, he was content to enrich the state and his friends and to return as poor as he had set forth. When someone was praising an orator for his ability to magnify small points, Agesilaus said, "In my opinion it's not a good cobbler who fits large shoes on small feet." Another time Agesilaus watched a mouse being pulled from its hole by a small boy. When the mouse turned around, bit the hand of its captor and escaped, he pointed this out to those present and said, "When the tiniest creature defends itself like this against aggressors, what ought men to do, do you reckon?" Certainly when somebody asked what gain the laws of Lycurgus had brought Sparta, Agesilaus answered, "Contempt for pleasures." Asked once how far Sparta's boundaries stretched, Agesilaus brandished his spear and said, "As far as this can reach." On noticing a house in Asia roofed with square beams, Agesilaus asked the owner whether timber grew square in that area. When told no, it grew round, he said, "What then? If it were square, would you make it round?" Invited to hear an actor who could perfectly imitate the nightingale, Agesilaus declined, saying he had heard the nightingale itself. ^ Smith, William (1870). Dictionary of Greek and Roman biography and mythology. v. 1. London: James Walton. p. 69. ^ Bury, J. B.; Meiggs, Russell (1956). A history of Greece to the death of Alexander the Great (3 ed.). London: Macmillan. pp. 844, 847. ^ The Shorter Writings. Cornell University Press. 2018. p. 85. ISBN 9781501718519. ^ a b c Snodgrass, Mary Ellen (2015). Coins and Currency: An Historical Encyclopedia. McFarland. p. 125. ISBN 9781476611204. ^ a b c Souza, Philip de; France, John (2008). War and Peace in Ancient and Medieval History. Cambridge University Press. p. 41. ISBN 9781139469487. ^ Heskel, Julia (1997). The North Aegean Wars, 371-360 B.C. Franz Steiner Verlag. p. 96. ISBN 9783515069175. ^ Bury, J. B.; Meiggs, Russell (1956). A history of Greece to the death of Alexander the Great. London: Macmillan. pp. 627–628. This article incorporates text from a publication now in the public domain: Smith, William, ed. (1870). "Agesilaus II". Dictionary of Greek and Roman Biography and Mythology. Cartledge, Paul. Agesilaos and the Crisis of Sparta. Baltimore: Johns Hopkins University Press, 1987. Forrest, W.G. 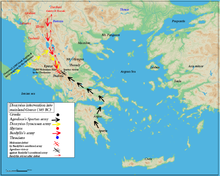 A History of Sparta, 950-192 B.C. 2d ed. London: Duckworth, 1980. Plutarch. Agesilaus. In Plutarch's Lives, Translated by Bernadotte Perrin, 11 vols. Cambridge: Harvard University Press, 1959-1967. Xenophon. A History of My Times (Hellenica), Translated by George Cawkwell. Boston: Penguin Books, 1966.